Blood Diamond (confict diamon in common use to describe diamondsmined and sold in war zones) is adventure thriller drama film written and directed by Edward Zwick, and starred by Leonardo DiCaprio, Jennifer Connelly and Djimon Hounsou. The film was shot in Mozambique, Africa, with the storyline set during a civil war and the resulting chaos in Sierra Leone, and involves two men, Leonardo and Djimon Hounsou, who are from opposite backgrounds but find themselves working together to find a rare diamond that can change both of their lives. Jennifer Connelly plays an American journalist whose idealism is tempered by a deepening connection with Leonardo’s character. The movie is due in theater on December 15, 2006. 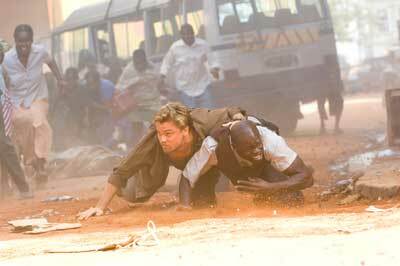 A scene from the movie Blood Diamond. This entry was posted on Sunday, October 15th, 2006 at 10:08 am	and is filed under Movie Trailer. You can leave a response, or trackback from your own site. One Response to "Blood Diamond (2006) Movie Trailers"
Oh this is one great movie it only greatly reminds me of Bruce willis in Tears of the sun. The Di caprio to me really brings out his best and Hounsou is great in his part.